The Callia Retreat Suites is located in Fira, the capital of Santorini. The property has a pool with sea views surrounded by palm trees and offers rooms with simple decoration typical of the Cyclades Islands. 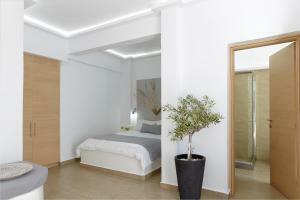 This suite is completely renovated and has a minimalist style decoration with the character of a Greek island. In addition, it has air conditioning, satellite TV, private bathroom, safe, refrigerator, hair dryer and balcony or porch. This suite has a balcony, tile / marble floor and DVD player. Suite with balcony and CD and DVD players.